If you are just joining us, you'll want to start here or check out my Clutter-Free Guide to Organizing and Managing Your Classroom. 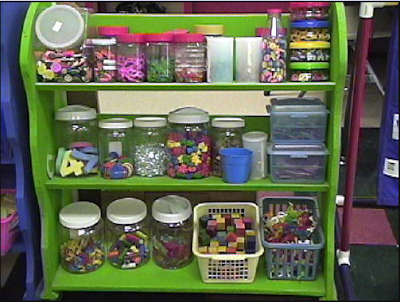 There I was wandering around cyberspace when I stumbled upon this cute little display of math manipulatives. 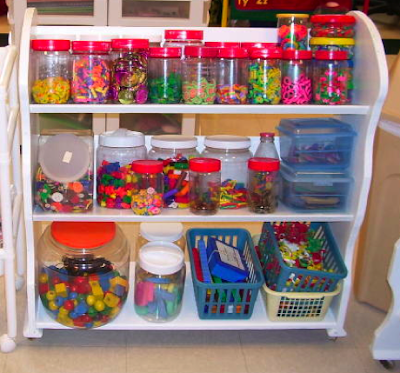 I desperately wanted to see more of this teacher's classroom, but the photo was a dead link. Lucky for me (and you), I am one heck of an internet stalker. Not only did I manage to track down the original site, but I did so even though the shelf was in disguise. Turns out the shelf belongs to The Virtual Vine which is one of the pioneers in teacher sites. I remember stopping by there way back when I was teaching K/1. The fact that this shelf had a before picture made me all the more giddy. Y'all know how I love me a good classroom before and after project.